We’ve seen firsthand the passion, dedication and talent that exist within the technology community in Iowa and throughout the Midwest. At Dwolla we view the Midwest as a tech leader and we want to continue to nurture our home as a place for investors, entrepreneurs and business people to make their mark. 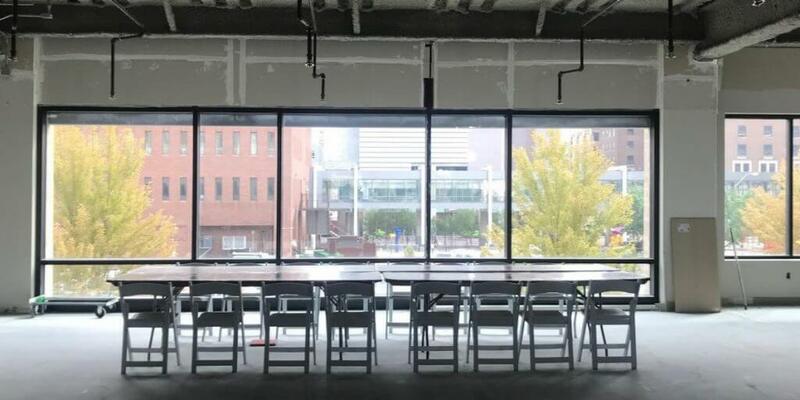 So it was fitting that a discussion focused on growing the Midwest technology ecosystem take place in a building that is under construction. On September 20, Dwolla hosted Steve Case—Co-founder of AOL and CEO of DC-Based investment firm, Revolution—for a roundtable discussion with community builders, local media, corporations, entrepreneurs, investors and startups from the tech ecosystem in Iowa. Participants in the roundtable discussed the challenges, obstacles and experiences entrepreneurs and investors face in the Midwest. The discussion had a similar theme to the “Rise of the Rest” bus tour that Case has organized for the last four and a half years. The Rise of the Rest tour visits emerging startup ecosystems across the country and provides Case with opportunities to share his knowledge with local entrepreneurs, investors and community builders. Late last year, Case launched the Rise of the Rest Seed Fund to invest in early stage companies outside of Silicon Valley. At each tour stop is a pitch competition where the fund invests $100,000 in a promising local startup. In 2014, Case brought the Rise of the Rest bus tour to Des Moines. The 90-minute roundtable discussion took place at Dwolla’s future home, an office space at 909 Locust St.
Case says he hopes these types of conversations—along with the Rise of the Rest bus tour—can help grow the Midwest startup ecosystem and bring more venture capital dollars to companies from outside of California, New York and Massachusetts. The consensus among the group was that resources exist in Iowa and around the Midwest—but investors are trying to figure out the right way to deploy that capital. In March of 2018, Dwolla hosted our first gathering of like-minded people with the growth summit, Monetery. What we found was an overwhelming demand for this type of event in Iowa. Many thanks to everyone who participated in the round table and for bringing your unique perspective to the conversation. We look forward to being a driving force and providing these forums to help make these connections and grow the technology ecosystem in the Midwest.